Candidate speeches are about to begin. Russ Diabo will be the first to speak. Each candidate has 30 minutes to speak. Diabo is expected to be drummed into the assembly. Candidates speaking in alphabetical order. Incumbent Perry Bellegarde up to bat first. Diablo next, and so on. 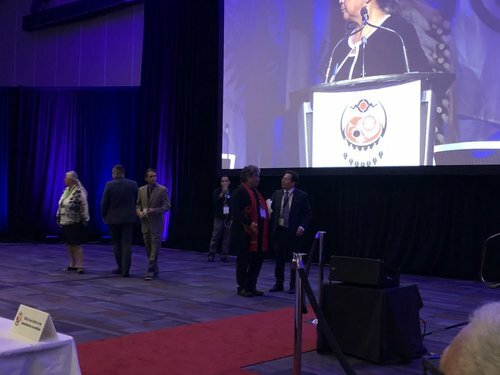 Bellegarde strolled up casually, received fair amount of applause. Diabo’s entrance. Supporters singing “We don’t need your constitution,” to drums. 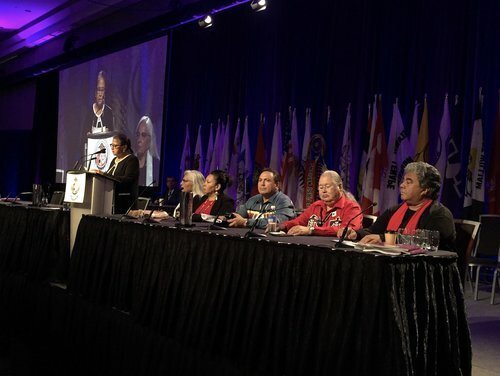 Russ Diabo says the AFN has "strayed from its principles." Diabo said he is also concerned about the relationship between the AFN and Ottawa. Diabo said PM Justin Trudeau is doing what Harper did, but has rebranded it. Diabo says that the Trudeau govt interpreting UN Declaration on the Rights of Indigenous Peoples in a "Canadian context." "Over the last 30 years,I have seen our rights being limited and terminated through policy after policy," said Diabo. 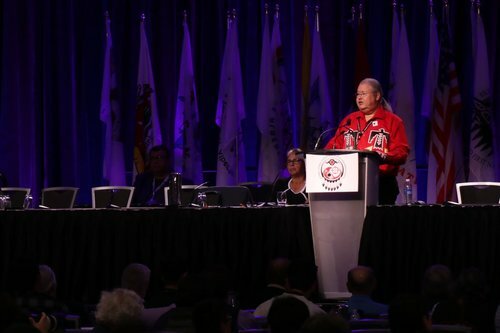 "(AFN has) turned into a cheerleader of the federal govt, they have lost control of the process," said Diabo. Diabo said Justice Min Wilson-Raybould told a Quebec chief in Feb that "with self government comes taxation." "Aboriginal treaty rights are collective rights, they belong to the people, where are the people’s voices in this?" said Diabo. "In the 1980's they called it the Buffalo jump. It's really not like buffalo, we are more like domesticated cattle," said Diabo. "If you want the status quo don't vote for me, if you want transformative change, then vote for me," said Diabo. Richardson is showing a video. Candidate for #AFN national chief is up now at the all-candidates forum. He starts his 30 minute time slot with a video on the big screens at the front of the room. "In many senses, Indigenous people in their relationship with Canada are at a crossroads." He says everything we do we must done in proper ceremony and thanks the host nations for their welcome. Haida Nations--Skidigate and Old Masset are standing with Miles Richardson. He introduces those representatives. "We must remember our inherent authorities," says Miles Richards. "The people who have the power to choose our path forward are sitting in this room." "When I stand before you and ask for your support I have a very clear picture in my mind. We are at a cross roads, we have an important choice to make." 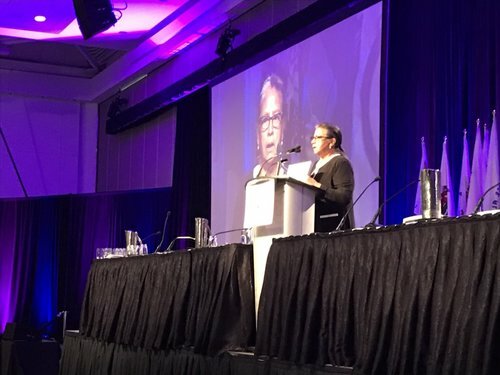 "For our people to be in charge of our destinies, there is no path forward to remain dependent on the Canadian govt and continue to take the crumbs off the table. The path I advocate, the path I stand for in asking for your support is the path of re-living," said Richardson. "I can feel it in my heart the dark cloud that heavy weight of oppression is lifting," said Richardson. "We need to take this last step, we need to stand up and assert our nationhood which is simply asserting and being who we know we are," said Richardson.